Article by Alfonso Chardy, courtesy of Neuvo Herald. Now that the Port Miami tunnel has been dedicated and the reversible toll lanes on Interstate 595 have opened, a third major South Florida transportation project is headed toward completion. The massive Miami Intermodal Center, just east of Miami International Airport, is expected to be ready in the fall when its last remaining component – the Miami Central Station – officially opens. Known as the MIC, the transit center is the costliest of the three projects, with a price tag of $2 billion, followed by $1.8 billion for the reconstruction of the reversible lanes on I-595 and $1 billion for the under-the-bay tunnel. Once the MIC is fully operational, a traveler could board a bus in Florida City, travel north on the South Miami-Dade Busway, transfer to Metrorail at Dadeland and head to the hub on the Orange Line to the airport. Then that traveler could take a Tri-Rail commuter train to West Palm Beach, an Amtrak long-distance train to New York or a transatlantic flight to Paris – all from the MIC. Connecting all major transportation services in Miami-Dade County in a single hub is the central goal of MIC planners. Those transportation modes include airplanes, rental cars, intercity and local bus services, as well as commuter, heavy-rail and long-distance trains. 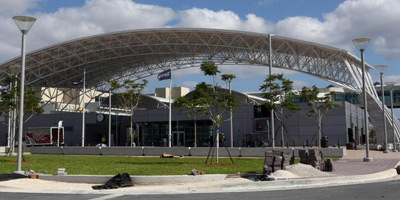 The transportation hub is not technically part of Miami International Airport, but serves as a satellite terminal because it is just east of the airfield and a few blocks from LeJeune Road. It is also connected to the airport via an automated train known as the MIA Mover. The mover allows arriving airline passengers to use the MIC to get to the car rental center or trains and buses – without ever having to step outside the hub area. This is how planners conceived operations at the MIC since the idea formed in the early 1980s. That’s when county officials realized they needed “connectivity” among transportation services so people in communities in southern and western Miami-Dade could get to their downtown jobs easily and quickly, not just in Miami but also Fort Lauderdale and West Palm Beach. But it wasn’t until 2001 that construction began on an improved roadway system around the MIC and on the first major component. The car rental center gathered in one, safe location instead of having the various companies scattered in an area east of the airport, not far from where the MIC now rises. The center was the first major MIC component, opening in July 2010. One of the benefits of the new center was easing of what once had been perennial traffic congestion on the airport roads where passengers are dropped off and picked up. The center’s opening eliminated the need for multiple shuttle buses that circulated on those airport roads to pick up or drop off car rental customers, MIC public affairs manager Ric Katz said. It will serve as Miami-Dade’s first all-inclusive ground transportation hub. Located east of the Rental Car Center, the MCS will feature grade level tracks for Tri-Rail, Amtrak, intercity and future high-speed rail service. Metrobus and Metrorail’s Orange Line MIA stations are also part of the new facility, with construction nearly complete, Katz said. Meanwhile, FDOT is negotiating an agreement with the Miami-Dade Expressway Authority – whose headquarters are located across from the MIC – to manage the facility.